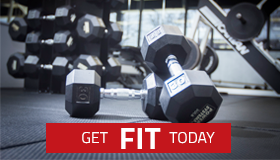 The training team at The Fitness Studio, work to build lean muscle in a variety of ways. Lean muscle development is achieved through diversity of training combined with comprehensive nutrition methods. Our certified, knowledgeable and experienced trainers utilize the latest techniques as well as classical theory to challenge clients in an efficient and safe way. Increased Training Frequency – If a client is looking for lean muscle development, the first strategy may be to increase the training frequency. Adding another session to a regimen challenges both the muscular and cardiovascular system to improve fitness levels. Varied Weight Qualities – Sometimes our trainers will encourage using various weight qualities either in a week of training or during a single session to add a cardio/metabolic element. This keeps the body guessing and avoids fitness plateaus. Compound Movements – Cardio/strength hybrid training and HIIT are just a few of the techniques used. Compound movements fire up a combination of the upper and lower body, plus the core for a full body workout. Targeted Isolation Movements – While it is impossible to spot-train a particular area, it is beneficial to strengthen certain muscle groups to increase lean muscle throughout the entire body. This training can be beneficial for injuries or targeting a specific sports or health goals. Commitment – Sticking to a program is often a challenge, and accountability helps. Our trainers not only hold their clients accountable but empower them, making them look forward to the next session. We work hard to make a routine that fits your lifestyle and keeps you motivated. Protein and Hydration – It has been said that a fit body is created in the kitchen, not the gym. This is partially correct, and it is proper nutrition and challenging workouts that are essential in building lean muscle. Our trainers will formulate a nutrition plan to include appropriate sources of protein and plenty of water for proper hydration. Recovery – Taking the time off between session to rest and recover is vital to building lean muscles. It is the time that the body adapts to the stress of exercise, and the real training effect takes place. Recovery allows the body to replenish energy stores and repair damaged tissues. Through the combination of these essential elements, you will see results. The Fitness Studio is the perfect environment, all you need is the right attitude. It is our mission to assist clients to achieve and exceed their goals. Contact us today to learn more.